The dividing of Iraq is now in motion. If I had put up this picture during the early stages of the Iraq war (2003/2004) – you would probably look at it and call it a ‘conspiracy’. Yet today, this picture brings home the truth, painfully as it might be, that Iraq had been lined up to be divided into three separate states all along. 1 – The language of the media has changed. No longer are they using words such as ‘terrorism’ or ‘Al-Qaeda’ to describe parties in Iraq. 2- Words such as Sunni, Shia and Kurds is being used instead to describe the parties involved in this new conflict. 3- ISIS is a group no one has ever heard of. In fact it took me a long time to find out what ISIS was short for, and to this group is suddenly making ‘military style’ strides inside Iraq and controlling territory, military hardware and well organized to take on US trained Iraqi military and government begins to sound alarm bells of who is behind them and what is their motive? As in the past, sectarian violence was the preferred method to harm the government. 3- The media such as BBC and their reports have started hinted of ISIS intention to control their occupied territory and making it their permanent state. As the news unfolds, and ISIS continue to make ground – like always I expect the US and UK (along with their allies) to drag their feet. It serves in the interest of the west, and more importantly, it makes Middle East more unstable thus easier to control by the west along with their assets. So, I predict in the next few months, the US/UK begin to talk to ISIS and seek to understand their terms. Their terms no doubt (as described in the picture above) will be to break a section away of Iraq to be governened and control by Sunni Muslims, leaving northern Iraq to be broken away for the Kurds and remaining part of the Shia Muslims. US/UK will ensure this is the case and so the new map of Middle East will be born. The facts remain unclear at this stage, but recent news on this matter seems to suggest Israel army have retaliated after one of their soldiers was killed hours earlier. In the past, and I recall similar incidents and escalations in 2010, when Israel army crossed and infiltrated into Lebanon, and of course the exact details were never confirmed or denied but ignored by Israel – the usual “no comment” policy. Don’t you find it strange that Israel in one paragraph echo confusion or a contradiction? First “suspicious movement” is identified. Shots are then fired, and then that suspicious movement becomes Lebanese Forces. No exact location is specified and no direct link to indicate if the “suspicious movement” was indeed Lebanese Forces or just couple of cats playing near the border. Despite the confusion and disinformation surrounding this recent incident, it will be interesting to see how both sides handle this. We have seen how the situation can deteriorate between both sides in the past and are these recent events a trigger to descend the region into turmoil, again? This morning I was up at 6am (UK time) to tune into ARY News, probably the only Pakistani International News station which was reporting, the developments of Dr Tahir-ul-Qadri political challenge to the ruling government of Pakistan and its opposition party. I followed this demonstration for almost a week now and last night when Dr Tahir-ul-Qadri reached Islamabad and addressed his gatherers – he announced that up until 11am the following day was the deadline for the government to salvage any integrity and to discuss reform with him. For me, this has been an interesting development and change in politics for Pakistan albeit following it from UK. 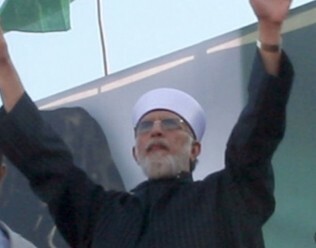 Interestingly enough, I was totally surprised how Dr Tahir-ul-Qadri and the Tehreek-e-Minhajul Quran long march had developed ‘possibly’ into a ‘game changer’ for Pakistan and its current weak government – who, according to popular public opinion – have achieved nothing but anarchy at an unimaginable level in its first democratic five years. The live broadcast from ARY News and its confident and courageous news presenters dotted strategically around the March since it started to this very second showed the power of Pakistani people. Those very people, who feel betrayed, robbed and oppressed by an elite of political gangsters who have done nothing more than to serve their own interests. The address this morning, which was scheduled for 11am by Dr Tahir-ul-Qadri but was actually given after 2pm was a true challenge to the current ruling government of Pakistan. During the address, many technical difficulties were reported live as the authorities deliberately sabotaged the communication around the country and around the world – but that didn’t stop the address. What was a true turning point in favor of the general public was when the Supreme Court of Pakistan authorised arrest warrants for the Prime Minister of Pakistan Raja Pervez Ashraf and his accomplishes in a pending corruption case. This saga is ongoing. What is remarkable to me, and at one point, a commentator echoed exactly what was in my mind was that since the current government of Pakistan has taken office – under the leadership of Asif Ali Zardari – three prime ministers have been appointed and each one removed due to involvement in corruption. So is there any credibility left for the current PPP (Pakistan Peoples Party)? Shouldn’t Mr Asif Ali Zardari resign from his post immediately and recall early elections to avoid this country from being destroyed? Anyway I’d like to see what your view on this whole political change is? The following is what Rabbi Shalom Rav writes – I must admit, although simple language is used it is inspiring and heart warming. Israel’s military assault on Gaza in 2008-09 represented an important turning point in my own relationship with Israel. I recall experiencing a new and previously unfamiliar feeling of anguish as Israel bombarded the people living in that tiny, besieged strip of land over and over, day after day after day. While I certainly felt a sense of tribal loyalty to the Israelis who withstood Qassam rocket fire from Gaza, I felt a newfound sense of concern and solidarity with Gazans who I believed were experiencing nothing short of oppression during this massive military onslaught. And now it’s happening again. Only this time I don’t think the term “anguish” quite fits my mindset. Now it’s something much closer to rage. Let’s be clear: this tragedy didn’t start with the Qassams. It didn’t start with the election of Hamas. And it didn’t start with the “instability” that followed Israel’s withdrawal from Gaza. No, this is just the latest chapter of a much longer saga that began in 1947-48, when scores of Palestinians were ethnically cleansed from their cities and villages in the coastal plain and lower Galilee and warehoused in a tiny strip of land on the edge of the Mediterranean. By all accounts, most were simply too overwhelmed to realize what was happening. Some tried to return to their homes and were killed on sight. Others resisted by staging raids in the newly declared state of Israel. Sometimes they succeeded, more often they did not. Either way, Israel decided early on that it would respond to each of these reprisals with a overwhelming military show of force. And those reprisals and that show of force have essentially been ongoing until this very day. I realize, of course, there is plenty of political subtext to this latest go-around. I’ve read the timelines and have formed my own opinions on the latest “who started it?” debate. I’ve also read plenty of analyses by Israeli observers who believe that this was not a response to Qassam fire at all but was very much a “war of choice” waged by an Israeli administration looking to shore up political support in an election season. I’ve also read a widely circulated article from Ha’aretz about Israel’s recent execution of Ahmed Jabari (the head of Hamas’ military wing). I learned that up until now, Jabari was “Israel’s subcontractor” for security in the Gaza Strip, that Israel has been literally funding Hamas through intermediaries in exchange for peace and quiet on their southern border, and that when Jabari failed to deliver of late, the decision came down to take him out. Another article, written by the Israeli who negotiated with Jabari for the release of Gilad Shalit, revealed that negotiations were still ongoing between Jabari and Israeli officials when Israel assassinated him with a drone strike. Yes, the wonky side of me has been avidly reading all these analyses. And while I do believe they provide an important counterbalance to the mythic statements by Israel’s Foreign Ministry and the US State Department, the more I read the cynical political subtext for this war, the sicker I get. No, this isn’t about Qassams, but don’t be fooled into thinking it’s about elections either. It’s really just the most recent chapter in a much longer litany of injustice – the latest attempt by Israel bring the Palestinian to their knees through the sheer force of their formidable military might. Like last time, I know many in the Jewish community will say it is unseemly of me to criticize Israel this way while Israelis live in fear of Qassam fire out of Gaza. I know there are those who believe that by writing these words, I’m turning my back on my own people in their time of need. But I know in my heart that my outrage at Israel’s actions goes hand in hand with compassion for Israelis – particularly those who know that their leaders’ devotion to the sword is leading them into the abyss. I believe Israel’s response to Hamas’ missile attacks have been disproportionate and outrageous. I believe their actions only further endanger the security of Israelis while inflicting collective punishment and a severe humanitarian crisis upon Gazans. Indeed, just as I cannot understand what it must be like to be a citizen of Sderot, I cannot even begin to imagine what it must be like to be a Gazan citizen at the moment, living under constant air attack, with no running water or electricity and dwindling food, as hospitals fill up with wounded and corpses lie rotting in the streets because relief workers are unable to reach them. When will we be ready to accept that this is not a “balanced” conflict or even a “war” by any reasonable definition – and it never was. When will we face the painful truth that this is not a story about one side versus the other but about one side oppressing the other? Frankly, all the well-meaning liberal comments about “praying for peace on both sides” and leave me cold. Worse, I find them insidious because they simply serve to support the myth that this is a conflict between two equal parties. It is not. And peace will not come until we admit this – until we admit that there is an essential injustice at the heart of this tragedy and that try as it might, Israel will never be able to make it go away through the sheer force of its increasingly massive military might. Beyond the rage, I’m heartened that this time around there is a growing community of conscience that is speaking out publicly and in no uncertain terms to protest Israel’s latest outrage in Gaza. I am so deeply grateful for my friends and colleagues at Jewish Voice for Peace, who is alone in the Jewish world in condemning this latest assault. I urge you to read JVP’s courageous statement, which I know gives voice to increasing numbers of Jews and non-Jews, young and old, religious and secular, who are coming together through the courage of their convictions. At this point in my posts I would typically write “click here” to lend your voice to some kind of collective statement. I’m going resist that temptation and urge you instead to take to the streets. While it is unlikely that the escalating violence in Gaza will be placed into proper context by United States media, who report on it in the context of Israel’s blockade and occupation of Palestinian land, it is also just as unlikely that there will be any meaningful coverage on how Israel justifies bombing civilian infrastructure in Gaza. Under this concept, it is hard to see how Israel would not be able to justify hitting any part of Gaza and killing any person inside or nearby that infrastructure. Saturday morning, according to Haaretz, Israel’s air force targeted Gaza’s police headquarters, other government buildings and a mosque in Rafah. It also is impossible to see how a cease-fire can be brokered if Israel is going to destroy the offices of political leaders elected in disputed or undisputed Palestinian elections. Because Israel considers the democratically elected Hamas to be a “terrorist organization,” Gaza technically has little in the way of structures for administrative or traditional government functions that could not be characterized in some way as part of Hamas’ “terrorist organization.” And so, that is why it is not a war crime to Israel to hit an office where he met Egyptian Prime Minister Hisham Qandil the day before. The mention of “civilian casualties” is a token gesture to a Palestinian people the US is willing allow Israel to continue to subject to a blockade in Gaza and policies of apartheid. Moreover, Haaretz has reported that Interior Minister Eli Yishai said on Israel’s operation in Gaza: “The goal of the operation is to send Gaza back to the Middle Ages. Only then will Israel be calm for forty years.” It is hard not to interpret that as a commitment to further devastate Gaza to force it to submit even more to Israeli dominion. — “Israel is unjustly accused of not wanting peace with the Palestinians. Nothing could be further from the truth.” In fact, he once called the peace process “a waste of time,” governing accordingly to avoid it. — Peace “can only come through….mutual trust,” he said, adding that he envisions “peace in which a demilitarized Palestinian state recognizes the Jewish state.” In fact, they’re preconditions solely for them, no other states with which Israel has diplomatic relations, including peace treaty terms with Egypt and Jordan. — “Israel stands ready to make compromises necessary for peace.” In fact, Israel never had a peace camp. For decades, efforts were stillborn, obstructing it, perpetuating conflict, and denying Palestinians a sovereign independent state or a viable one-state solution for all its people. In fact, claimed existential “security” threats are bogus, a red herring, mischaracterizing Israel as vulnerable, surrounded by hostile Arab states. Nuclear armed, it’s a regional superpower, unthreatened since the 1973 Yom Kippur War. Addressing Congress on May 24, he repeated the same canards, including saying he’s ready to “make painful compromises (for) peace,” while remaining obstructionist against it, a viable Palestinian state, Jerusalem as its capital, Hamas/Fatah unity, and the inviolable right of return. “….Palestinians will not get a right of return to Israel…. Jerusalem will never again be divided,” and Israel’s 1967 borders aren’t defensible. New ones must incorporate expanding settlements, an IDF presence along the Jordan River, and Palestinians confined to isolated cantons in ghetto communities or worthless scrubland, an offer no responsible leader will accept. Moreover, he demanded abandonment of Palestinian unity as a precondition for negotiations, saying Hamas rejects Israel’s right to exist. In fact, it accepts it in return for a viable Palestinian state within 1967 borders, 22% of historic Palestine, a major concession Israel rejects, wanting all valued parts of Judea and Samaria. In response, Mahmoud Abbas said he offered “nothing we can build on.” In fact, he “traveled far from peace,” subverting it by dictating terms, remaining obstructionist like all Israeli leaders. Instead of new ideas, a constructive vision, and genuine willingness to negotiate equitably, “we were witness to the same old messages,” dictating terms, offering nothing substantive in return. Like America, in fact, most Israel parties differ little on core issues, including Likud, Kadima, Labor, Yisrael Beiteinu, and Shas, endorsing hardline militancy and neoliberal toughness, offering no concessions for equity and peace. “His speech was a blueprint (on) how (to) defend Israel in refusing to end the occupation, oppression, and subjugation of the Palestinian people. The focus on the Jewishness of the Zionist state has been the new ploy to block any peaceful resolution.” Palestinians reject it as should everyone for equal rights and peace. If anyone doubts “how Israeli leaders control the US government,” watch congressional and other pro-Israeli groups’ fealty to Israel, subverting any chance for justice. “It was an address with no destination, filled with lies on top of lies and illusions heaped on illusions.” Rarely do foreign leaders address Congress. Perhaps none ever presented “such a pile of propaganda and prevarication, such hypocrisy and sanctimony” as Netanyahu to repeated standing ovations, a bipartisan hallelujah chorus loving it. If most Americans did also, “we’re in big trouble,” said Levy. Imagine, Netanyahu praises Israeli democracy when he’s hammered it with mortal blows. His coalition Knesset partners passed racist, fascist laws, vilifying anyone not Jewish, denying their basic rights, including treating Israeli Arabs as existential threats when, in fact, they’re citizens like all Jews. His speech was “composed of dozens of gimmicks and empty cliches, talk of peace which he does not intend to conclude and of a fictional Palestinian state which he has no intention of seeing become reality. (Instead, he intends) to continue occupation rule over millions of people by (brute) force, against their will,” perpetuating decades-long harshness. Its statement echoed Netanyahu’s lies and racist condemnation of an entire people for their faith and ethnicity. Commentary magazine’s Jonathan Tobin called his speech “a triumph….eloquent and brilliant (laying) out Israel’s desire for peace,” when, in fact, it spurned it since 1948. Peace, in fact, depends on evenhanded give and take, resolving divergent issues equitably for both sides. It can’t solely be on Israeli terms, demanding capitulation, leaving Palestinians isolated in a wasteland of destruction and human misery, enduring appalling indignities for their faith, ethnicity and presence. — full recognition as a UN member state with all rights and privileges. On November 15, 1988, the Palestine National Council (PNC) proclaimed an independent Palestinian state. According to the 1925 Palestine Citizenship Order in Council, Palestinians, their children and grandchildren are automatically citizens, including refugees. The Security Council, in fact, recommends admissions. The General Assembly affirms them by a two-thirds majority. In December 1988, it did so, granting Palestine all member rights except to vote. PA leaders will seek it in September. Washington and Israel object, spurning peace, reconciliation, and potential challenges to their dominance. No longer can that agenda be tolerated.